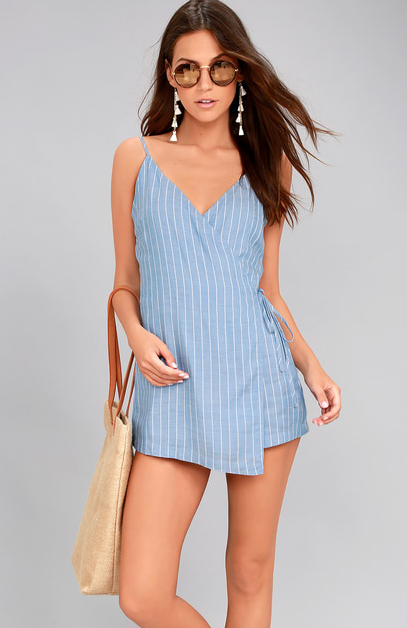 What do you call a romper that looks like a dress? No idea? Me either! I have been looking for the right term in order to write this blog post but I don't know if there is a correct term for it. If you do comment below! I was looking for the correct term because I was trying to find similar options to my outfit so I can share them with you, but I didn't know how to look for them, when I was about to give up I actually found two or three options I will share below. The reason why I was really trying to find more styles like the one I am wearing is because I loved loved loved it! It is super comfortable, easy to wear and it looks good. It is effortless, you look well put together and the shorts make it so convenient for a busy day. I think that this is a piece that lots of people with different lifestyles and age groups would enjoy having in their closet. I have a busy lifestyle and even though I do not have children I think moms would really enjoy wearing this. I say this because at work (where I sell women's clothes in case you don't know) many moms come in and say they won't wear certain things like dresses because they often have to be running around their toddler and picking them up, so a dress is inconvenient. This is the perfect solution! Designers if you are listening, make more styles like this one. For those who don't have kids like myself this is still a really convenient, effortless and easy to wear piece, specially on a hot yet windy day. Not too long ago I wanted to wear a dress, I didn't check the weather and I wore it. It was windy! Yes, I showed more than I wanted to and to more than one person. But thats not the most embarrassing part, I really wouldn't have felt as embarrassed if it was strangers but they weren't strangers they were actually people I do business with on a weekly basis. I quickly got into my car and drove away. I wish I would have worn this that day. But I learned my lesson, I check the weather now hahaha. Anyways these are rare to come by but if you do come across one of these wrap rompers or dress rompers I would suggest trying it. Bellow I'll share a few I found.